Announcement of Todd Albrecht's placement as president to lead the company through their recent and ongoing growth. Edgewater, FL, April 05, 2019 --(PR.com)-- Dougherty Manufacturing, a full-service manufacturer along the Space Coast of Florida, announces the promotion of Todd Albrecht to President. This appointment comes as the company continues to innovate in the marketplace, positioning itself as the ultimate single-source manufacturer of composites and metal fabrication. Todd will continue the drive for manufacturing excellence, building on the already robust quality standards. With experience in manufacturing gathered from across the marine industry, Todd will offer new avenues for growth as the company pursues further work in the theme park industry, aerospace, defense, and "New Space" fabrication - a burgeoning, Florida industry. 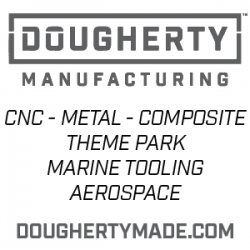 Beyond theme parks and aerospace, Dougherty Manufacturing has recently moved into marine tooling. With state of the art DMS milling tools, and a team approaching 200, Dougherty Manufacturing is accepting a growing list of work to tool next generation boats across the marine industry. From small composite parts to full liners, hulls, or decks, their capacity is clear. “These new avenues for Dougherty Manufacturing have changed our positioning. As we move to a premier, global fabrication outfit, and expand to industries such as marine tooling, aerospace, and New Space, in addition to theme parks, Todd will be essential in managing and ensure success in these pursuits,” said Stephen Dougherty. Under this leadership, Dougherty Manufacturing will continue to develop its CNC, metal fabrication, composite expertise, and manufacturing excellence. At Dougherty, we strive to inspire, actualizing innovative fabrication solutions that will define the future of manufacturing. Simplifying complex intricate projects while benefiting the community through comprehensive solutions to complex problems to global projects. “Let your dreams leave the atmosphere. We’ll engineer them back to Earth.” Designers. Problem-solvers. Craftsmen. We’re these things and much more. We have the certifications, experience, advanced CNC machinery, and economical processes to handle your entire project, from idea to completion, with ease. No matter how small or large we scale to fit the project. Local Fabrication, Global Reach: Our metal fabrication division offers bending, forming, shearing, welding and waterjet cutting. We use a state-of-the-art 5 axis Flow waterjet cutting system, HAAS CNC machining centers and lathes, as well as a series of 5 axis DMS router machines for tooling. The fiberglass division covers everything from molding, tooling, design and manufacturing. Our aluminum division contains many of these same services and we manufacture one of the most widely purchased aluminum boat step products in the United States. Complete engineering and design services are offered across all of our capabilities. Dougherty Manufacturing is founded on innovation and community. We’re passionate about manufacturing solutions never seen before. It all started at a very young age for Stephen Dougherty as he stood at his father’s feet learning all about boats. Since then, Stephen and Sarah Dougherty have grown their own company into a leading manufacturer with the space and equipment to handle any project. Seriously, any project. No matter how large or complex, the Dougherty’s thrive on innovation, and they’ve surrounded themselves with a talented, like-minded team of skilled craftsmen and women. Additional information about Dougherty Manufacturing’s products and services is available at doughertymade.com. Follow our news on Facebook at Facebook.com/DoughertyManufacturing and on Instagram at Instagram.com/doughertymade. Dougherty Manufacturing, the Box logo and other marks are trademarks of Dougherty Manufacturing and/or Dougherty Manufacturing affiliated companies. All other marks contained herein are the property of their respective owners.